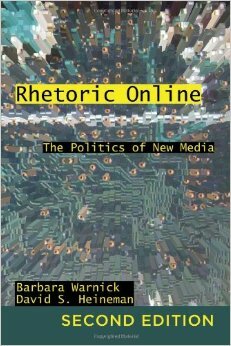 Rhetoric Online: The Politics of New Media 2nd Ed. The subtitle, “The Politics of New Media,” leads the reader to believe they will be studying “behind-the-scene” political maneuvering within electronic media. However, the opposite is true; the reader is learning about new media and how it applies to and affects politics. A more apt name would be "New Media of Politics." This 2nd edition, published 5 years after the 1st, offers new chapters on viral video, social identity, and social media, plus online anti-institutional politics. Because there is a rich array of statistics in all of the chapters, the authors could have included charts and graphs which would have been helpful for full appreciation of the data. The challenge with books like these, which focus on electronic media and/or politics, is that they quickly become history books. Online applications and electronic means along with politicians change so rapidly. This book could have a new or updated edition every two years, and perhaps that's a good idea. In addition, the book would have been more effective and pertinent to students of politics if written and published immediately following the 2012 election cycle rather than the 2010 midterms. For students of rhetoric, Rhetoric Online: The Politics of New Media is applicable as long as the electronic forms are applicable. What is not addressed in this book, and rightly so, are the sociological and anthropological results of new media application in a political and in a non-political sphere. (That would be a whole new book entirely.) However, discussion of these potential results can create interesting class discussion. Questions and comments regarding the increased use of electronic apps for socialization, political donations, news gathering, hacktivism, and remote location combat can create lively discussion and potential in-depth research projects for students. Overall, not only would this book be a helpful addition to a classroom setting, but scholars and those working in the political field would find it a helpful and interesting read. Knowing one's audience and how they use online media is a vital component of any political party or group. Warnick, Barbara, and David S. Heineman. "Rhetoric Online: The Politics of New Media Second Edition." NY, NY. Peter Lang Publishing, Inc. 2012.